Continuing on from last week’s Mass Effect: Andromeda first impressions, the second half of the discussion panel focused on early-game narrative and character interactions in the game. Markus and Deana posited possible changes that may have enhanced the story’s narrative and emotional impact, and compared some of the new characters to our old favorites from the original trilogy. The duo then delve into a discussion centered around the change in dialogue options presented in Andromeda, and conclude with a small discussion on NPC interactions aboard the Tempest. As was the case for the previous post, this discussion took place after about ten hours of gameplay (more for Markus) and focused on early impressions of narrative in BioWare’s latest entry to the series. Spoilers are minor, but present – be warned! DJ: I love the main thrust of the story concept — you’ve traveled over six-hundred years to reach a new galaxy, clinging to the hope that worlds observed from afar are habitable. It’s a strong set up with an overarching motivation, and there are great pieces in the opening. But I also found some of the story beats to be awkward at best. MP: How so? I noticed a handful of cliche elements that drove the story forward really quickly; I mean, your dad is done for in the first half-hour/hour of gameplay, you’re burdened with the mantle of Pathfinder, and left alone with a family member in a narratively-convenient coma so that the responsibility for humanity lands solely upon the player. In an hour, that’s a lot to take in, but you’re right — it really delivers a ‘trial by fire’ start. DJ: I did find the cliches caused more problems than they solved in terms of opening story momentum — and I say this as a fiction writer with a healthy appreciation for tropes. But part of what separates good storytelling from the rest is understanding when you’re using tropes and knowing how to give them a twist. Take Dad. We know Dad is going to die/be critically injured/turn evil because Ryder is the main character and has been advertised as the Pathfinder. Now, we can kill dad right away or we can play with those expectations, making the player doubt whether Dad is really going to die and building Dad’s unique relationship with our Ryder. Then, when it will hurt more, we kill Dad. This would do a couple things: it would invest us in the relationship that constrained our character creation and it would let that death have a greater impact on both player and character. MP: Interesting take — killing dad would be huge; what if he’s put into a similar coma as Sis, but SAM presents the idea of the AI transference so that someone can guarantee the continued efforts of the human Pathfinder? Pull the plug on dad for the immediate benefit of humanity/Pathfinder status? 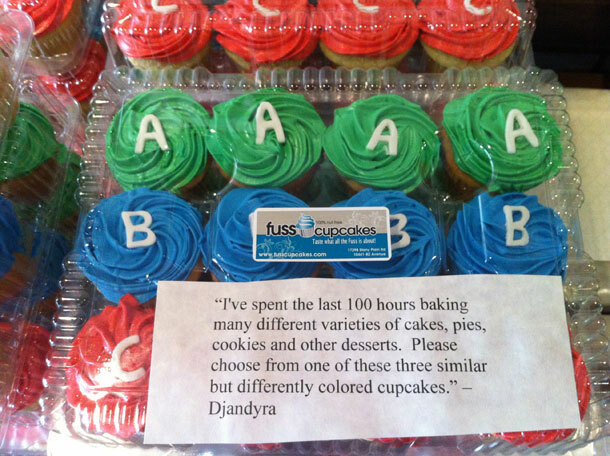 Hmm..
DJ: And those are the kinds of questions I’ve come to expect from Bioware. Am I playing the hardened survivor, who will pull the plug for the good of mankind? Or am I playing the soft-hearted paragon, who believes a cure can be found in these new worlds? DJ: True. (That was a lot of cake). In a less dramatic sense, Dad could have still died at the end of the first mission, but be present with Ryder until that point. Ultimately what frustrated me was that I’d been limited in my character creation because of this family element, and then afterwards I didn’t get the opportunity to connect with that element before it was taken away. MP: That’s another interesting point. You get a handful of choice-centric conversations with the guy, see him tear through a Kett base, and then he’s gone. You do learn more about him (and the missing family element) through the memory trigger/ SAM node side missions, but it would have been a better drive to include some of that up front. DJ: The cliche with Ryder’s sibling being in a convenient coma didn’t really bother me, and they framed it well with the timing with the arrival events. I would have liked it if the sibling coma had offered a reason for why Dad was so intent to explore the planet, despite the damage done to the ship and against the Captain’s advice… However, all that grump and nitpicking aside, the journey to the first planet and the freefall sequence was fantastic. MP: True. They way that they’ve dropped us (as the players) into the worlds of Andromeda is great — quite literally — when the situation goes sideways on the initial planet approach. Once the intro-mission is done and dealt with (bye, Dad), I had some difficulty understanding where the story would be going. Sure, the whole Initiative mission is to settle colonies in Andromeda, but what, exactly, would be the story arc that ties together the various elements of exploration undertaken by Ryder & co.? Curiously, it wasn’t until (much) later that I came to understand where the narrative was going, but I’m hesitant to discuss any details in a ‘first impressions’ piece such as this. DJ: I fully agree. The first mission might have had its bumps, but it had a clear intent. From what I’d gotten to explore following, that intent has been harder to discern. I suppose much of it is simply for the purpose of exploration, though I’m assuming the Kett represent the Big Bad which will eventually need to be deposed. MP: Yep — you’re on the right track. Without going into too many specifics, ol’ Ring-Head that you meet (the guy trying to interface with the vault) is the Big Bad that you’re working against. The Kett, overall, have a very ME2 ‘Collector’ feel about them, and the story converges to a pretty cool “Ohhh, I see what it all means now” moment once you’ve made your way down this open-ended path that’s been set in front of the player. DJ: Perfect. This is what I’ve been hoping to hear. MP: There’s a lot of substance to be built, that’s for sure. 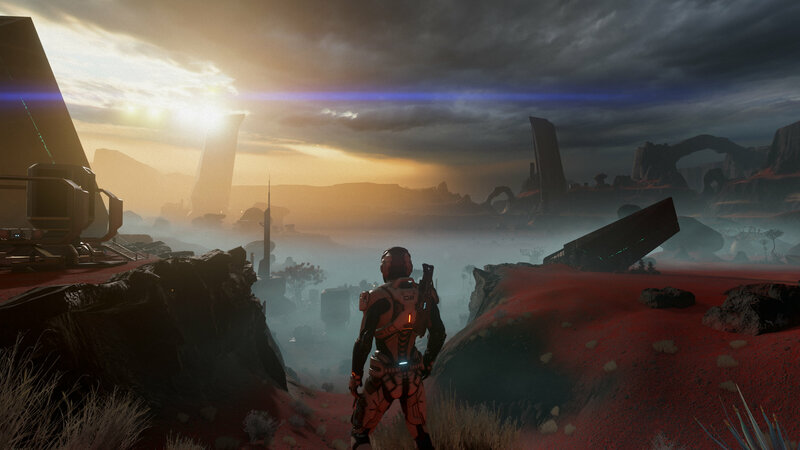 If Bioware end up turning Andromeda into a series (still unconfirmed, but I remain hopeful), there can be some heart-wrenching decisions/conversations to be had in the future with quantifiable, oft-undesired results simply because I’ve taken the time to talk to anybody I wanted to learn more about. Remember Joker from ME1-3? Of course you do — when you see the measurable role he has in all of the games despite barely getting out of that chair of his, it’s hard to believe that an NPC impacted the story so much. What will we see from these characters? DJ: One thing we can count on with Bioware is an extraordinary secondary cast. 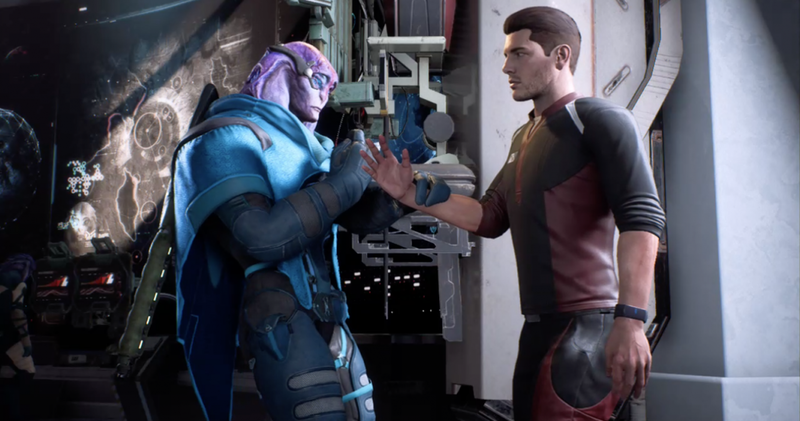 I’m not at a place where I’m invested in Ryder or the characters yet, but I’ve barely scratched the surface of the game. I can see the potential to care deeply about the cast, and for them to have an impact on par with Joker or Tali. But not Garrus; he is in a separate, very exclusive category of ‘Space Boyfriend’. MP: Can’t blame you there at all. Garrus was my squadmate of choice for 1-3, and when I found him on the moon in ME3 holding strong against the Reapers, I wanted little more than for him to join the team again. When he did, it put the game back onto a whole new level of greatness. DJ: One of my all time favorite moments of any Bioware game. They had me going — I genuinely thought they’d sidelined Garrus as they had Wrex. But nope. I don’t usually cheer about being wrong, but I did then. MP: For sure — everyone and their mums love Garrus. 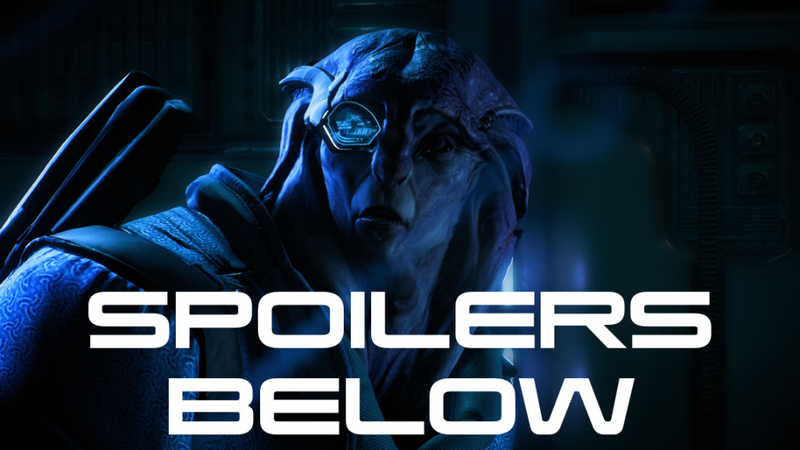 I think Jaal has the potential to be my ‘new Garrus’, blasphemous as it may sound to hear. He has this well-metered cadence to everything he says, he offers analysis to the situation, and is a relatable link to the new, alien world(s) we find ourselves in. I’ve been hearing that Vetra’s setting up to be the new Garrus in a female embodiment, but I’m saving all of my non-Drack, non-Jaal companions for future playthroughs, as noted above. DJ: Jaal does seem like a fantastic character and I’m looking forward to gaining him as part of my team. I will acknowledge his potential for Garrus-esque or Garrus-ish, but, like the One Ring or the Highlander, there can be only one. MP: Dialogue, as it does in all things Bioware, obviously makes for a huge section of the inter-character relations in this game. What’s new with Andromeda, however, is how the conversation points that Ryder can select from are given a new standing; Logical, Emotional, Professional, and Casual, in addition to the classic question/exposition labels. What’s your take on being told how the game is likely to react to your conversational input? DJ: You know, I’m not yet certain. With the ‘Renegade’ and ‘Paragon’ options of old, it was clear how your choices where shaping your character, and while I like the greater variety, the choices also feel less distinct to me. I’m also not sure to what extent these choices will directly inform plot, or whether they’ll more lend the the general tone each scene. MP: I hear you. That uncertainty in dialogue options is difficult to embrace. Bethesda arguably went too streamlined in Fallout 4’s four-choice, quick-summary dialogue options, and fans modded the hell out of it so that the players could know what the player would say. Andromeda is far less stringent in telling you roughly what Ryder’s about to say, but there’s still something a little off with it. Not sure why I feel that way this time; it’s almost exactly the same in ME1-3, but I suppose I felt less obligated towards saying one thing or another based solely on the icon attached to the input. DJ: Yeah, that sums up that part of the experience well. I do think that part of that ‘slightly off’ feeling circles around the options being less tied to a specific character type. As much as playing Renegade could be restrictive or even unpleasant, you built a specific kind of character for Shepard that left you knowing what that Shepard would do regardless of tags. For Ryder, it feels less formed at this time. MP: Each conversation doesn’t drive the character into a ‘good/bad’ archetype; you’re simply choosing options available to the pre-established character and, though it works, is a curious break from character progression in titles prior. DJ: They have done a great job of maintaining the sensation of fluidity in conversation, with Bioware-standard side-conversations driving side missions and influencing the overall plot. Though I’m not overly impressed with the conversations that take place on the Nexus, which feel oddly disconnected from each other. MP: There’s a lot of time spent chasing down various people on the Nexus to get a better understanding of what’s going on. I’ve gone back a couple of times to address various outstanding quests/tasks, and each trip has taken a solid amount of time to get my backlog of “talk to Character A” updates out of the way. It’d be sweet if various areas were more accessible on foot rather than the tramway, but that’s a relatively minor grip to have; “there’s too much to see!”—can’t believe I’m saying that about a Mass Effect game. DJ: You might want to go make sure you’re not running a fever. 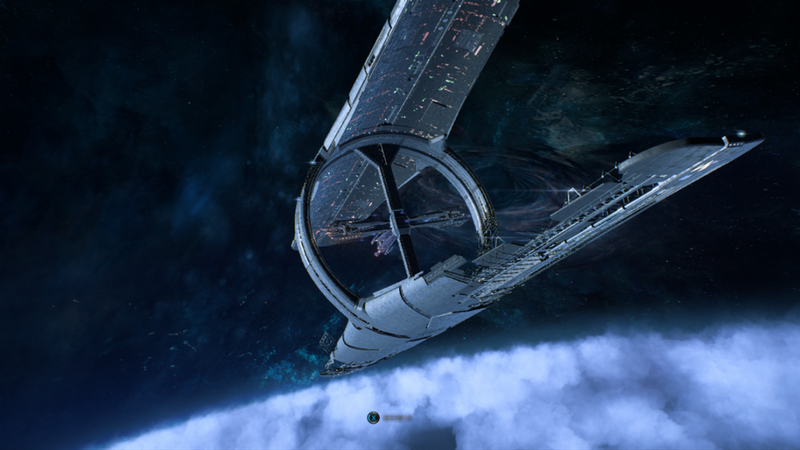 But I do love the scale of the Nexus and the variety of inhabitants—it is also a strikingly designed ship. MP: If we can take a step back for a moment; are you getting the feeling as well that conversations actually seem to have a greater inter-personal meaning than they have had in previous entries? Specifically, conversations that you have with people on your ship are really bringing the characters to light. In ME1-3, there were plenty of people manning the Normandy that you never got to speak to even once. Abstract characters looking at computer monitors to make everything seem more populated; in Andromeda, I’m feeling like every person aboard is helping, but also a fleshed-out person in their own right. DJ: I absolutely agree. The environment aboard Ryder’s ship is extraordinary and those interactions really create the sensation of not just a crew, but a community behind the exploration. MP: Yep. One that sticks out for me happened last night: I walked up to the bridge and spoke to Suvi, just as she was closing out a conversation with Lexi, the ship’s doctor. It was only a few lines of medical advice, but checking that she’s alright had her tell me about how she’d developed some reaction to licking a rock. Going further, she started talking about her scientist parents, going for field trips and being taught to pay attention to human senses used before the sci-fi scanners took that analogue measurement system out of the picture. Then, the conversion moved even further towards her opinion and feelings regarding leaving her parents behind during her exodus from Sol. It brought so much meaning to the character, and that’s one of several dialogues to be had with the NPC members of the crew. It can be really amazing. DJ: That is such a brilliant example of good storytelling through dialogue. I’m so glad we’re doing this first response, because with every question I’m finding more reasons to look forward to playing the game and getting further into the story. Scholarly Colleague DJ Holmes and I discussed the above (and previously-published) notes a handful of times in the weeks prior to the launch of the website. This conversational piece has been intentionally held back from publishing so as not to run the risk that newcomers to our site would find themselves exposed to potentially-spoiling articles without much else to offer in the interim. Now, a full month after the game’s release, we feel that the site is beginning to offer enough other content so that a day’s posting can include spoiler territory for those still interested in picking up the game for themselves but haven’t yet done so. Coincidentally, I finished up the game’s main story this evening, after spending (several) dozen hours with Pathfinder Ryder and the crew of the Tempest. As a longtime fan of all things Mass Effect, I worried that the game would fail to deliver on any of the outstanding elements that have long been a BioWare tradition. Commentary circulating on Reddit, Facebook, and a number of other publications indicated that the game may have come up short, though I avoided reading too deeply into those concerns in favour of experiencing the game for myself. My take? Outstanding game, start to finish. The mechanics are incredibly smooth, the open-character system (abandoning permanent class choices) allows for a truly customized protagonist, and there’s almost too much secondary/tertiary narrative for completionists to sift through. Do I need to hear every single thing that every NPC has to say after each major mission/milestone? Probably not (read: definitely not). But as someone who understands that Mass Effect has, historically, brought forward a ton of subtle nuance to flesh out the later entries in the franchise, I found myself curiously subject to the Fear of Missing Out on content that hasn’t yet been released. Later playthroughs will be more streamlined, and I look forward to seeing where the series (if it becomes one) will lead the members of the Andromeda Initiative. JungleDrums: Ep 46 – When Will Bungie Learn?